Opulent lakeside dining at Chez Roux. 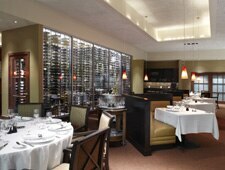 : Master chef Albert Roux’s first American restaurant doesn’t disappoint. Set in a 65-seat, standalone building at the La Torretta Del Lago Resort & Spa on the shore of Lake Conroe, Chez Roux is worth the 55-mile drive from downtown Houston. The legendary London-based chef has created a menu that blends contemporary French cuisine with seasonal, regional produce procured from an on-site vegetable and herb garden, local farms and Texas cheesemakers. The well-thought-out menu includes a light Maine lobster mousse wrapped in spinach and drizzled with Champagne sauce and a heartier terrine of squab, Parma ham, foie gras, mushrooms and duck breast with a truffle vinaigrette. A cassoulet of John Dory and gulf shrimp was a little on the watery side, although the slightly nutty-tasting white beans pair well with the seafood. Try the Black Angus rib-eye for two, accompanied by the house béarnaise and sautéed vegetables. Decadent desserts and an extensive wine list, heavy on French labels, add to the lakeside dining experience. Day-to-day kitchen chores are handled by chef Matthew Gray who changes the menu weekly.